It's Who You Know is the long-awaited handbook to effective, productive and influential networking. Having the right relationships is more important than ever before, but digital connectivity and social media has changed the landscape. Social media has made networking easy, but has it made it better? In an age of digital disconnect, having the right relationships is more important than ever before with more and more of us reporting we feel disconnected from social media. Networking is no longer about collecting business cards and meeting thousands of people online or offline; it's about knowing the right people, and nurturing those relationships. You only need 12 – or even just four. Approached strategically, this comparatively small network will provide the strength, diversity and opportunities to help you achieve your personal and professional goals. This book shows you who you need to know, how to get to know them and how to make value a two-way street. Action plans, checklists and an online diagnostic tool help you start taking steps right away, and the emphasis on "doing" over endless planning gives you the motivation you need to get up and go. The old adage "It's not what you know; it's who you know" has never been more applicable than it is today. 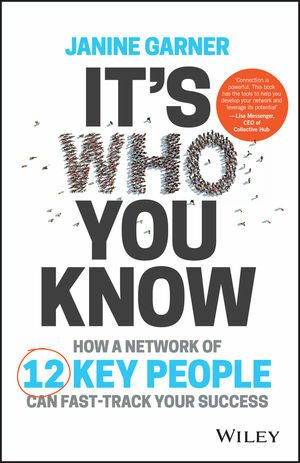 The problem is that many of us "know" thousands of people across social networks, but how many of those people truly know you and how many of them are truly connected to you? It's time to clear out the network clutter and identify those who actually add value to your professional and personal development. Today, jobs are filled before they're advertised and previously unthought-of collaborations appear out of nowhere. Networking has become a critical factor for success. It's Who You Know brings networking into the modern era, and shows you a strategic approach to making it work for you. JANINE GARNER is a leading international expert on leadership, influence and collaboration, the author of From Me to We, and the founder and CEO of LBDGroup. She is a sought after speaker, trainer and mentor who works with Fortune 500's and who has helped launch and reinvigorate top brands, including Hewlett Packard, Westpac, CISCO, Scentre Group, CBRE and Ralph Lauren.